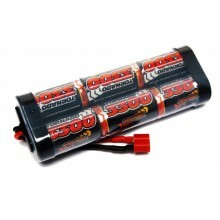 Brushless and Built to Blast! As an all-in-one on-road off-road vehicle for everyday back yard bashing you have to go a long way to beat a traditional 2WD buggy. A classic design thats survived the test of time the format has proven perfect for both novice and professional drivers, yet rarely does the type offer the refinement, the strength, the speed, and the road holding of the Conquest 10B XLR. Produce a list of desirable must-have features for your new buggy and theres every chance the Conquest will have them. Starting with its 3300kV brushless motor and water-resistant LiPo-compatible electronics, speeds of 25mph (with the included 6-cell NiMH) and a breathtaking 40+ mph (with a 3s LiPo) are yours for the taking. But speed is nothing without strength and handling so weve given the 10B a winning feature-set that includes four wheel independent suspension, adjustable, oil filled, coil-over bladder shocks, a wide track LCG (low center of gravity) chassis, a rugged, light and impact-resistant composite construction, a compact and robust planetary gear differential, and a drivetrain that wont let you down. Add an aggressive forward cab body, striking graphics and high grip all-terrain tires, and the result is a ready to run car thats as comfortable flying jumps as it is kicking dirt in the headlights of the opposition. The Conquest 10B XLR " winner by name, winner by nature. Reaches speeds of 45+ mph with an optional 3S LiPo. 1 x Conquest 10B XLR. 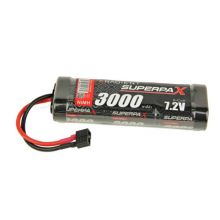 Nimh Battery Pack SubC 3300mah 7.2v Premium Sport - Now with Deans Connector!